Where others see a blank stretch of wall on the side of 118-120 Northampton St., the building’s owner, Borko Milosev, sees potential. That’s why he has commissioned a mural by artist Scott Albrecht to adorn the space. Albrecht will begin working on Thursday, Nov. 16. The work will be done in coordination with Easton Murals, marking the second project in what organizers hope will be a series of murals around the city. “I’m a fan of art, and any opportunity I have to share it with the world, I do,” Milosev said, noting the location of the mixed use building felt like a prime spot for a mural. It’s not the first public art project for Brooklyn-based Albrecht. His murals are on display from New York City to Los Angeles. His work has been exhibited in the U.S. and internationally, including the Shepard Fairey (of the iconic Obama poster fame) Subliminal Projects gallery in L.A. His art has been displayed in several publications, including Juxtapoz and Hi-Fructose Magazine. Learn more about Albrecht at scottalbrecht.com. Work on the mural is expected to be finished by Nov. 22 (though that’s weather dependent), with Albrecht working most days from 8 a.m. to sundown. Easton Murals is a project conceptualized by Brick + Mortar Gallery owners Tom D’Angelo and Chaz Hampton, and Easton Main Street Initiative. The first Easton Murals piece was painted in August 2017 at 49 N. Bank St. by artist Giancarlo DeMarchi. The program was announced in April 2017, and through a series of fundraisers, and a grant from the Greater Lehigh Valley Chamber Main Street Foundation, planning for the murals could begin. 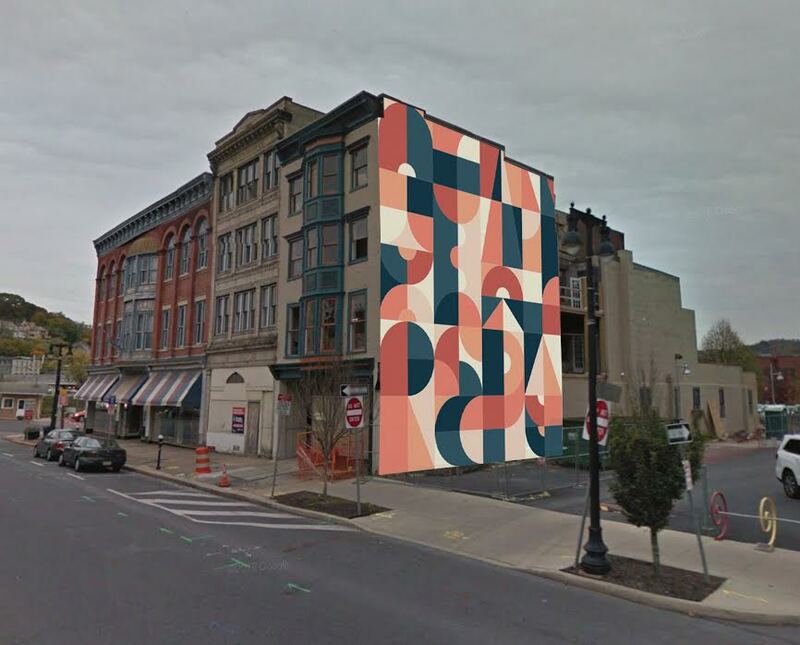 A third mural location has been announced at Spring Garden and Bushkill streets, on a retaining wall jointly owned by Tomias Hinchcliff (Genesis Bicycles) and Clay Mitman (Berkshire Hathaway HomeServices). Work on the third mural will start in spring 2018. A call to artists is open now through Jan. 15, 2018. Find more information at eastonmurals.org. Ultimately, Easton Murals organizers hope to bring murals into surrounding Easton neighborhoods once the program has been established. To learn more about the Easton Murals program, please visit EastonMurals.org. ABOUT: Easton Main Street Initiative (EMSI) is a subsidiary of Greater Easton Development Partnership, a registered 501c3. EMSI’s mission is to promote/encourage/enhance the economic strength and vitality of Easton’s central business district through volunteer and community driven efforts. To learn more about EMSI, visit Eastonmainstreet.org.